Students salute Islamic teacher in Thailand. Thailand is faced with many internal problems and the political and economic situation remains fragile because of the ongoing political turmoil. At the same time, it is abundantly clear that the Muslim uprising in the southern provinces is a major concern for not only Thailand but for the wider community throughout the region. After all, the global jihadist network is always looking for new opportunities to spread more mayhem and to maintain military and economic functions. Therefore, you have two important dimensions in southern Thailand. One, and of course the most important component at the moment, is the ongoing anti-Buddhist campaign whereby Islamists desire a pure Islamic state. The other important component is that if the Thai military loses control and if Buddhists continue to flee southern parts of Thailand, then the Islamic internationalization of southern Thailand will become a regional issue and this notably applies to Indonesia, Malaysia, and the Philippines. It must be stated that in parts of Indonesia and the Philippines you already have Christian and Muslim tensions and you have several radical Islamic networks in both nations. The most notorious Islamic terrorist networks apply to Jemaah Islamiya (JI) in Indonesia; the Moro Islamic Liberation Front which seeks an Islamic state in the southern Philippines; the Abu Sayyaf Group which is also based in the southern Philippines; and you have other networks which have either lose ties or regional agendas and of course Al-Qaeda have links throughout the region. In the past the conflict in southern Thailand was mainly an internal struggle between the majority Muslim community of three southern provinces (Pattani, Narathiwat, and Yala) and the government of Thailand. Therefore, for many decades you had the desire for an Islamic state but nationalism was also a core base for demanding independence. However, in recent times it is clear that the Pattani United Liberation Organization (PULO); the Barisan Revolusi Nasional-Coordinate (BRN-C); Bersatu; Gerakan Mujahadeen Islam Pattani (GMIP); and others, desire an Islamic state and they have a jihadist agenda. Therefore, in the past the Muslim insurgency was aimed at the government and military of Thailand but times have changed. Therefore, since 2001 it is clear that you now have an overwhelming Islamic jihadist agenda and this is aimed at forcing the Buddhists to flee and moderate Muslims are also being killed because they are deemed to be traitors. 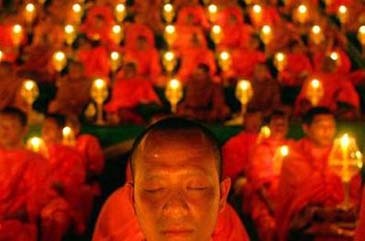 Sunai Phasuk, a political analyst at Human Rights Watch, commented that “Buddhist monks have been hacked to death, clubbed to death, bombed and burned to death.” Therefore, the Sunni Islamic insurgency is just like radical Islam in Afghanistan and Somalia, to name only a few places in the world. After all, in Somalia it is clear that Sunni Islamists are intent on killing every last Christian in this nation and in Afghanistan the followers of radical Islam are even intent on wiping out every trace of Buddhism in this land. Therefore, the past Islamic jihads which destroyed Buddhism in Afghanistan weren’t good enough because under the rule of The Taliban they even began to destroy all traces of Buddhism during their year zero campaign. Therefore, the Sunni Islamic insurgency in southern Thailand is following a familiar path and this applies to the destruction of all non-Muslim elements within society or the complete dhimmitude of all non-Muslims by the rule of fear. In truth, this is a continuation of what the prophet Mohammed did because he also began the annihilation of Judaism and Paganism in Arabia and on his deathbed he then called for all non-Muslims to share the same fate in Arabia. Zachary Abuza, author of Militant Islam in Southeast Asia (Crucible of Terror) and Conspiracy of Silence (The insurgency in Southern Thailand), and a host of other written materials, highlighted the role of the madrasas (Islamic schools). Therefore, while past insurgencies fused the Islamic faith with nationalism, it is clear that this is no longer the case and instead southern Thailand is faced by the forces of radical Islam. This new pattern is intolerant towards any diversity and Buddhists are deemed to be subhuman and compromise is not on the agenda. Another important factor is that Islamists are always looking for a fresh opportunity to spread their hatred and ideology. Therefore, if America and other allies begin to contain radical Islamic forces in Afghanistan and Iraq, then just like the past they will look for new ventures and areas to cause chaos. This factor alone means that southern Thailand, Indonesia, and the Philippines could witness further infiltration of international jihadist movements in the future. Added to this is the geopolitical and geographic reality which holds many opportunities for the international Islamic terrorist movement. Abu Bakar Ba’asyir and JI have a goal and this is to create a super-Islamic state which would incorporate Indonesia, Malaysia, the southern Philippines, Brunei, and Singapore (some would also include southern Thailand). This may seem impossible to most people or an illusion, but an illusion in the eyes of radical Islamists does not hinder insurgencies or international Islamic jihadist movements which enter conflicts when the time is right. International Islamists have moved freely between Afghanistan, Bosnia, Chechnya, Iraq and a host of other countries. Therefore, failed states, narcotic wars, chaos, ethnic divisions, and other dark forces are grounds for Islamists to create more chaos and often with Saudi Arabian funding. Turning back to Zachary Abuza he highlights some Islamic leaflets in his book called the Conspiracy of Silence. These leaflets are aimed to intimidate the local community and many are directed towards the Buddhists. Therefore, the ongoing insurgency is southern Thailand may be viewed to be isolated but clearly this area could be used by international Islamists to further their power base and the importance of the Malacca Straits must not be overlooked for international Islamic terrorists. After all, the region is of major strategic significance and terrorist organizations like al-Qaeda desire to cause economic mayhem where possible. Overall, it appears that Thailand is going from one political crisis to another in Bangkok but for the Buddhists of southern Thailand and moderate Muslims it is one long nightmare. A major Islamic insurgency is ongoing and given the complexities of the region, then links with JI and other Islamic terrorist networks is clearly a cause for major concern. If the current situation prevails and Buddhists continue to flee because of countless massacres by Islamists then the central government in Thailand will have little power to control southern Thailand in the future. If this happens, then this area will be cleansed of Buddhists and the next fear is that this region will be utilized by international Islamists.